The four unicorns Glitterluck, Stardust, Marvel Flower and Magic Swirl live in the far away Land of Clouds. 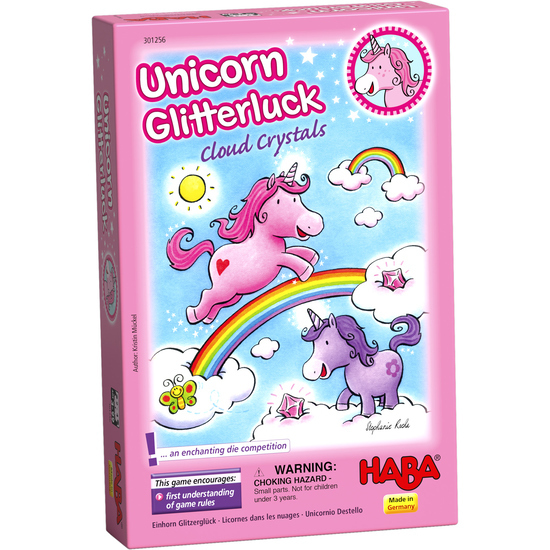 Playfully they gallop across the billowing clouds, slide down the colorful rainbow or play with the cloud crystals. Suddenly a terrible thunderstorm is brewing. On their journey to reach the sun as soon as possible, who will help the unicorns collect the most cloud crystals? Contents: 1 game board, 1 pink unicorn Glitterluck, 1 yellow unicorn Stardust, 1 purple unicorn Marvel Flower, 1 turquoise unicorn Magic Swirl, ?60 cloud crystals, 1 pink die with crystal symbols, 1 blue die with cloud symbols, set of game instructions.